Very Healthy. Made Two Ways. This Healthy Salad made from freshly Grilled Tuna is always a success whether served for dinner with crusty bread or for a luncheon with a creamy soup, Broccoli or Zucchini would be our choice to complete the meal, perhaps with a Clover Leaf roll. The first step is to grill the Tuna. Lay the tuna on parchment or other paper. Sprinkle both sides with a little salt and white or black pepper, your preference. Put a small amount of Olive Oil in the palm of your hand and massage it into the fish. This helps keep it from drying out on the hot grill. Preheat the grill to high heat, then turn down to medium high. Grill two to three minutes on each side, a little longer if required to make it medium. 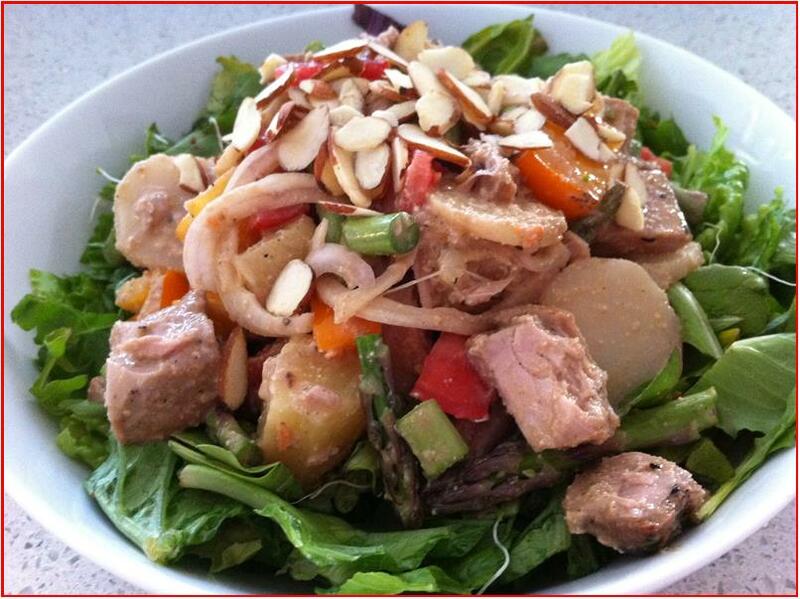 (We would cook it rare if eating as Tuna Steaks but find that medium is a better consistency for Salads.) Watch it carefully so it doesn't burn. Let it rest lightly covered for at least ten minutes so the juices have time to redistribute. Cut the Tuna into medium bites (we use a dice-type cut) and set aside. In a large bowl combine Tomatoes, Onions, Asparagus and Water Chestnuts. Add Olive Oil, Vinegar, Salt and Pepper (go easy - you can always add a bit more if you need it) and mix gently until vegetables are thoroughly coated. Then add the Tuna and with your hands gently mix again. Taste. Correct seasoning if necessary. Place the greens in the bottom of your serving bowls and mound the Grilled Tuna mixture on top. Sprinkle the Sliced Almonds on top, if desired. This Salad consistently meets with rave reviews and likely will become a regular in your home. Because of the mercury content now found in fresh fish, we recommend that you do not eat it more than twice a month.